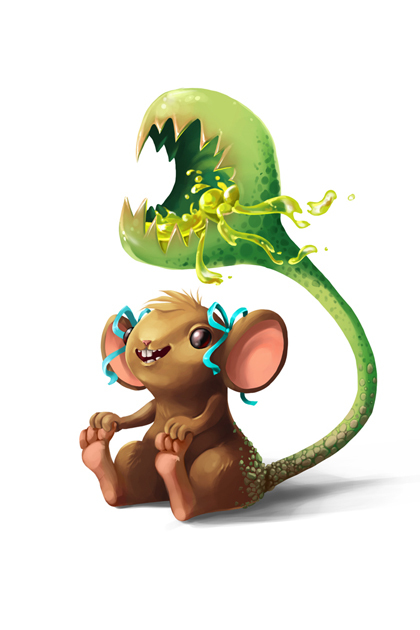 The Monster Tail Mouse is a breed of mouse found in the Toxic Spill, for hunters of rank Hero and above. While out picking flowers, this cuddly little one seems to have fused with some local flora. Not particularly harmful on her own, she enjoys wandering the wasteland, discovering newly mutated plants to pick. But watch out for her tail: It has quite the painful bite! Don't let her overall cute exterior distract you from her dangerous posterior! Monster Tail mice are especially attracted to Rancid Radioactive Blue cheese, to the point that any other kind of cheese will simply not suffice. Hydro type traps such as Oasis Water Node Trap or Phantasmic Oasis Trap are effective against the Monster Tail Mouse. The Monster Tail Mouse drops the Toxic Spill Egg during the annual Spring Egg Hunt. This page was last edited on 9 April 2017, at 01:24.